Did you always want the benefits of meditation without the required 20 to 30 minutes of sitting "doing nothing"? Perhaps you would love to meditate but find it difficult to relax your body long enough? Or maybe it's your mind that careens out of control, refusing to think of "nothing"? What if someone told you that you could get all the rewards of meditation - the health benefits, sharpened focus, a boost in memory - without the need to sit chanting some mantra for up to a half hour a day? 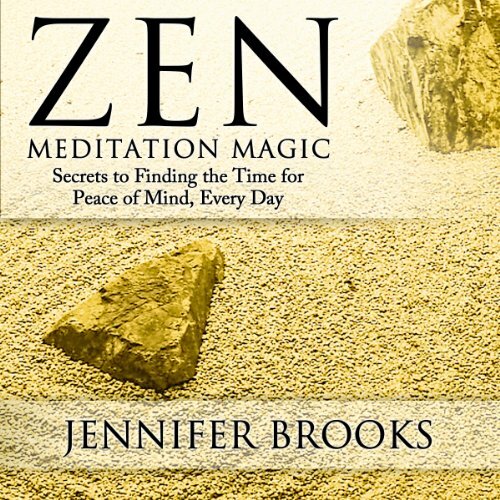 Zen Meditation Magic: Secrets to Finding the Time for Peace of Mind, Everyday provides you with practical, proven, and powerful meditative remedies to your stressful lifestyle. While it shows you how to meditate in the common 20-minute sessions, it also provides you with methods to grab minutes of Zen contemplation. Making Zen meditation a part of your daily life is easy. This groundbreaking book shows you how to take a Zen mindfulness break you can access when you're driving, drinking your morning coffee, even carrying out a conversation. Not only that, it also takes you step by step through the longer, more conventional way of meditating. You are in control of your meditative practices. You can choose to wade in slowly, tiptoeing through the shorter, productive exercises before you commit yourself to the longer sessions. You may want to start with the short sessions, sprinkling the longer ones into your life as you feel you're ready. Zen Meditation Magic: Secrets to Finding the Time for Peace of Mind, Everyday is your complete guide to Zen meditation. Whether you have 90 seconds (the time of a red light at a busy intersection) or 20 minutes, you can find a Zen meditative practice you can use to improve your overall health and give you the ultimate feeling of peace of mind. Pick up this book today and obtain the benefits of a Zen lifestyle! Very relaxing and educational the narrator is awesome. can't go wrong with this book. We all need to perfect our higher awareness of the Now and who couldn't use some peace and relaxation.